Put quite simply I adored this book. I read it in one sitting unable to put it down and went from chuckling away one minute to being close to tears with a lump in my throat the next. Phil Earle has pulled it out of the bag again and written a gorgeous book which I won't be able to help but recommend far and wide to all who will listen. 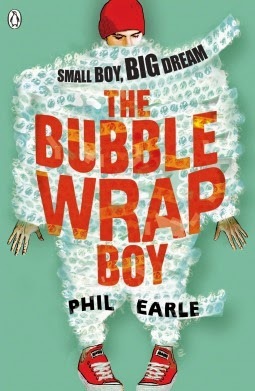 The bubble wrap boy is a book about Charlie. I adored Charlie. He's a short lad who is ridiculously clumsy with an over protective mother who drives him bananas. I loved his take on the world and seeing all the crazy situations his clumsiness end him up in. I found myself laughing a lot at all his mishaps and all the crazy things his mother did to try and keep him safe because they were so brilliantly bonkers yet you could just see it happening in real life. Charlie's voice and the situations he faces are both perfectly spot on and realistic. One thing I really loved about this book was the portrayal of the family unit. Charlie's mother is this overbearing character who goes above and often beyond to make sure Charlie is safe to the point where she regularly embarrasses him. You start to book feeling for both him and his father who just seems to accept his lot and keeps his head down for a quiet life. What I particularly loved however is as the book goes on you start to see more about the whys and wherefores of why Charlie's mother is so protective of her son and that's when the book packs an emotional punch and is its most poignant. I won't say much about it for fear of spoiling but I can't see anyone reading it without being touched by scenes that unfold before them. One things this book does well is in how it shows Charlie growing as a character through his choice to break free of his mother's overbearing restriction and become involved with skateboarding. I love how his confidence grows and how that then starts to change him as a character for the better as he starts to feel out the person he wants to be. Special mention also has to go to his best friend Sinus as I loved the way they interacted with one another. All in all a fabulous coming of age story which I was entranced with from the first page unable to put it down until I'd devoured every last word. Highly recommended.